Last weekend I spent three days in Long Beach, CA at the yearly Association Montessori International (AMI) USA convention for Montessori Guides of all levels in Montessori Education : Assistance to Infancy, Primary, Elementary and Adolescence. Some 1500 people were gathered in several ballrooms of the Westin Hotel, listening to 4 daily sessions on their level, with the overarching theme: ”How do we offer children opportunities to absorb our Culture(s)”. The speakers of the Primary Course were the Directors of Montessori Training Centers: Sandra Girlato from Toronto, Canada and Gretchen Hall from Hartford, Connecticut. They were funny, smart, honest and absolutely passionate about advocating for children. It was truly an inspiring event. an Absorbent Mind, which allows them to just be in an environment and absorb (several) language(s) and any skill they put their mind to! heightened periods of learning through the Senses, to learn exactly what they need to adapt to their family’s culture, laying the foundation needed to thrive in the culture of the world they live in, later in live. a very lively ‘Horme’ or Life Force and an innate potential to make it in their world. It depends on the adults, and the environment they prepare for the children, how these forces will unfold and take shape. Children do not need teachers to tell them what to do. They are capable of learning everything by their own exploration and discovery. They just need a Guide who follows each child’s individual learning path and feeds their interest by showing materials to support her/his joy of learning. Children need to manipulate, experience and practice everything they want to learn in a developmentally appropriate room, where they can be free to choose their own activities, communicate freely with others to build relationships, and build an understanding of every aspect of their world. They use the autodidactic materials that Dr. Montessori specifically designed to help children make knowledge their own. The presenters shared a thorough exploration of all the materials in our Children’s House: the purpose and goal for every piece of material, especially in Practical Life, Geometry, Geography and Science. Everything in the Children’s House is connected to each other and prepares the child indirectly for the work they do when they grow up to go to Elementary School, a whole new level of being and learning. According to Maria Montessori children unfold - as it where – their understanding of the people and the world around them by living in a community of children and a few adults. Adults with a trained eye, who understand when to stay out of their way and when to assist. Adults who observe and know they have a symbiotic relationship with the children. It is most like a home environment, where we live together and where children learn how to take care of themselves, of others and how to maintain the room. This is an organic growth process, full of individual experiences, impressions and discoveries for each child. 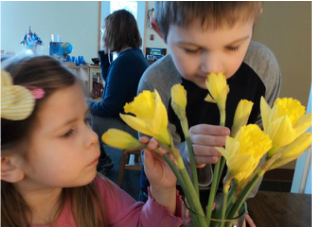 The Children’s House is where we prepare the soil and sow the seeds for all life-long learning. ​One other highlight in the Course was the role of Artistic Expression in the CH. It is a terrific way for children to feel and feed their heart and soul; to distinguish themselves. I am eager to find new opportunities for Arts and Crafts!